Last week I showed you the first part of my design and construction of 30-Second Hot Flashes. This week, we finish it up! 1. 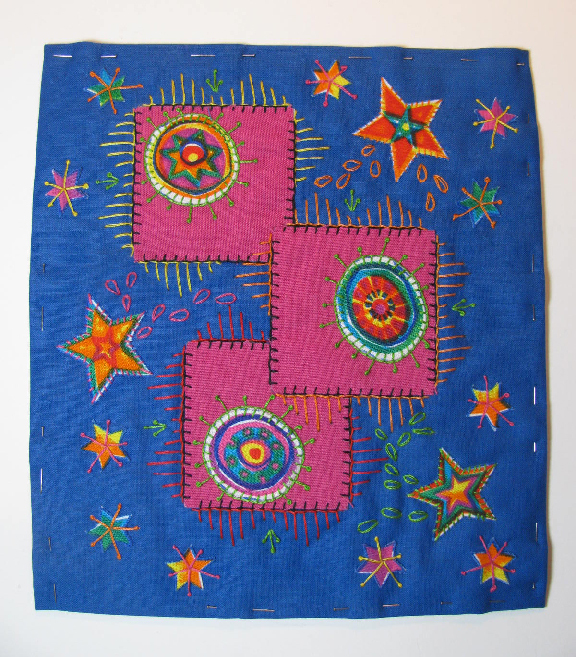 In this style of quilt block, I like to leave the outer edge of the top raw, but you could turn it under slightly if you prefer. 2. Cut the batting larger than the top, large enough to form a nice sized "frame" for the piece. I used a thick piece of wool felt inside to help keep it stretched. 3. 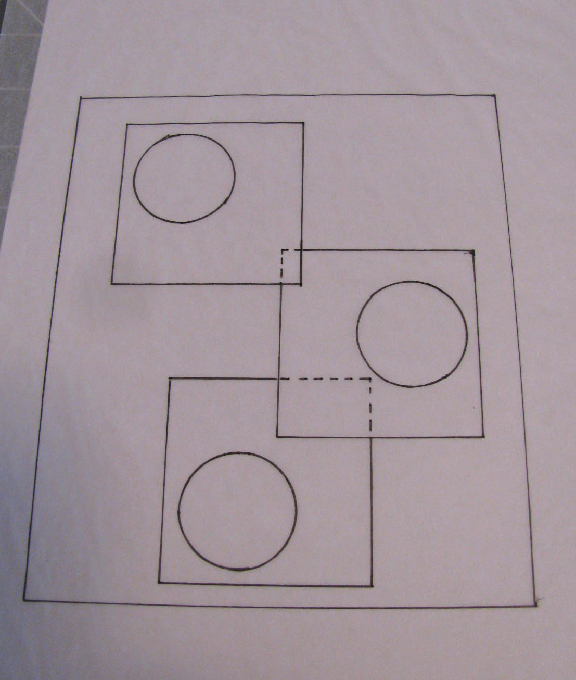 The wrap and tuck method of framing a quilt is explained in greater detail at the link, but basically, the backing fabric needs to be cut large enough to wrap around up over the batting, and tuck underneath the edges of the top. The corners can be mitered or left square. 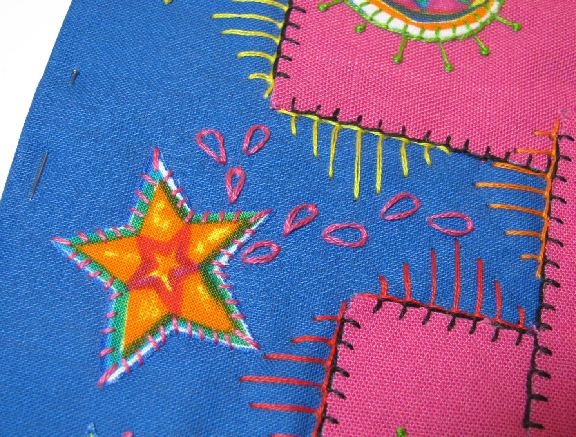 I decorated over the seams with feather stitch. 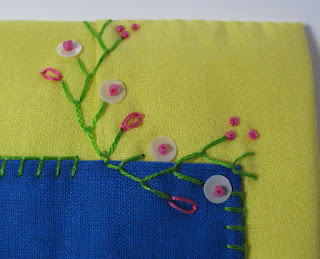 Use blanket stitch around the outside to attach the top to the other layers. Jean goes off the grid and onto the griddle as she explores a different form of creativity: she reviews a fun new cookbook! It's The Clever Cookbook,Get-Ahead-Strategies and Tips for Stress-Free Home Cooking ! Cherie's Burbach's new book, Art and Faith: Mixed Media Art with a Faith-Filled Message, is a beautifully produced compendium of art narrated by the artist. The My Twinn line of dolls, at one time, were truly works of art no longer available these days. 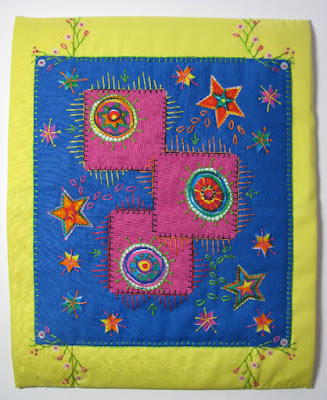 The latest free chart at Connie Gee's Designs is Rosy Square and it has blossoms to brighten your day. Sarah is trying to improve her crochet skills this year, and she's sharing tips and tutorials for knitters and others who haven't yet mastered this fun craft. This quilt block is a modern take on crazy quilting, even if it doesn't immediately look that way. 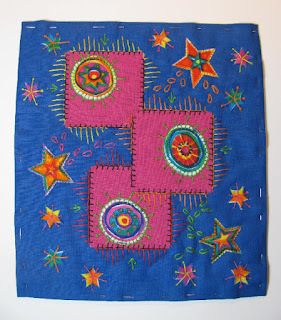 I have used raw edge patchwork blocks in the design, and have treated each edge as if it were a crazy quilt seam. My initial plan was to use more beads than I ended up with. I just liked the cleaner, less embellished look for this one. 2. Scan and size with photoshop if needed and print out. 4. Choose fabrics. 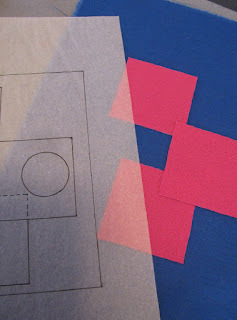 Cut out background fabric. 5. Draw pattern shapes on the back of lightweight fusible interfacing, fuse to chosen fabrics, and cut out. 6. 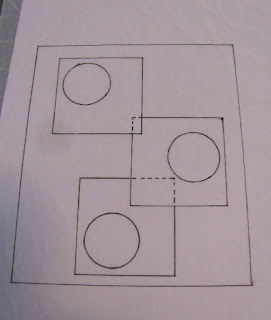 Use the tracing to position and pin the major shapes on the background fabric. Save the smaller shapes for later. 7. 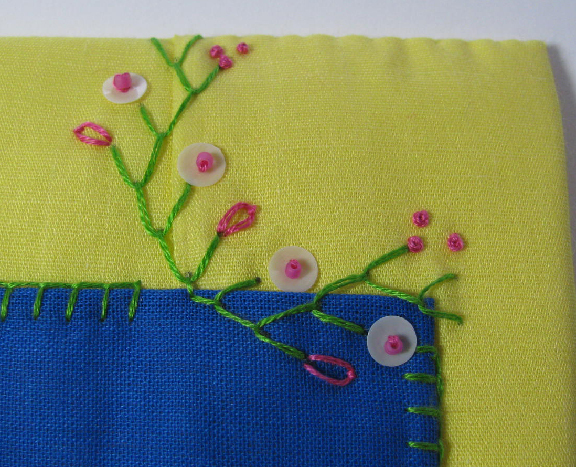 If there won't be any silk ribbon work, add a piece of batting before starting to stitch. 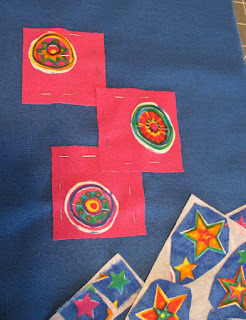 Stitch the major shapes in place, treating each raw edge as a seam for crazy quilt stitching. 8. Hoop it and do the embroidery. Next week - finishing up and adding a binding. 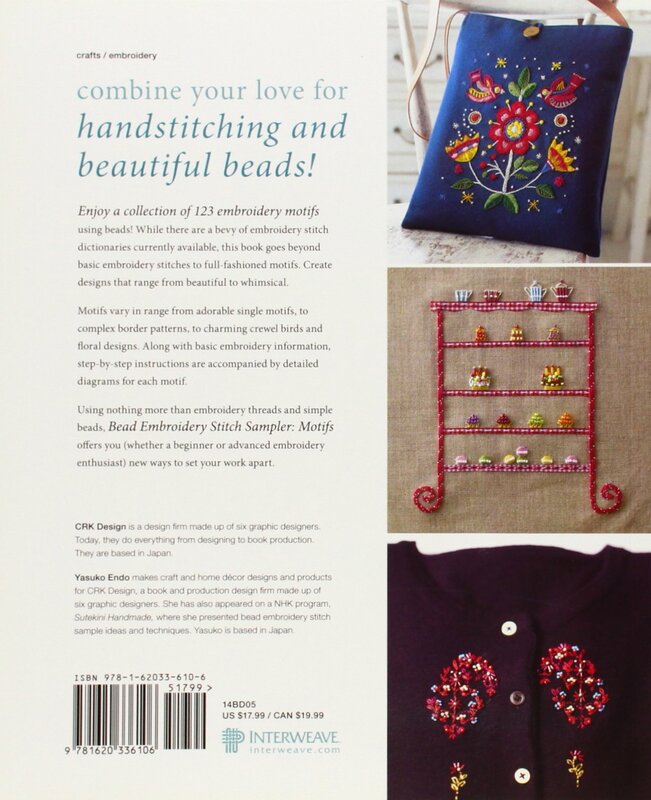 Check out Claire's inspiring art bead selection to match this month's challenge! The next section of Connie Gee's free SAL is available. It is the third of four florals. Get it on the SAL today! 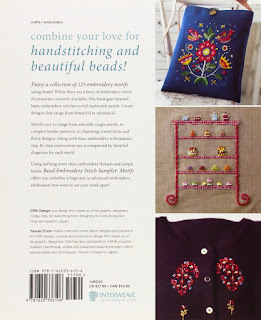 Jean reviews the delightful, fun and informative book, Knitting Ephemera! Don't like a piece of jewelry? Well, redo it. In this video, Terry shows you a piece that she made and was not happy with. Then re-does the piece and shows it off. If you plan to decoupage paper napkin images onto something to sell, check these patent and copyright basics. Paper napkins contain someone's art. The Crafty Princess is clearing out the old to make way for the new and donate part of the proceeds of craft her de-stash to charity. It took awhile for me to realize that a book I reviewed had a companion volume! 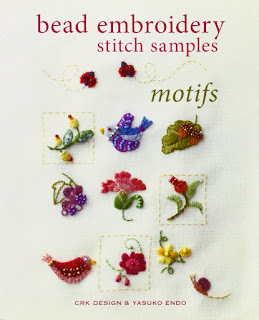 You may remember Bead Embroidery Stitch Samples, shown below. 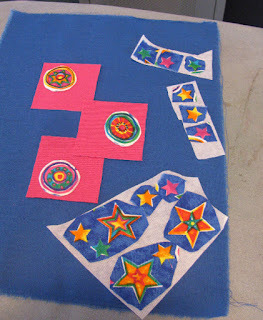 Instructions include each element, as well as how to put some of them together into fabulous pieces like the ones shown above. Toho bead numbers and DMC floss numbers are included for each sample shown, not that you have to use those exact colors, but it sure is nice information to have if you do want to! This book is the perfect companion for the first. 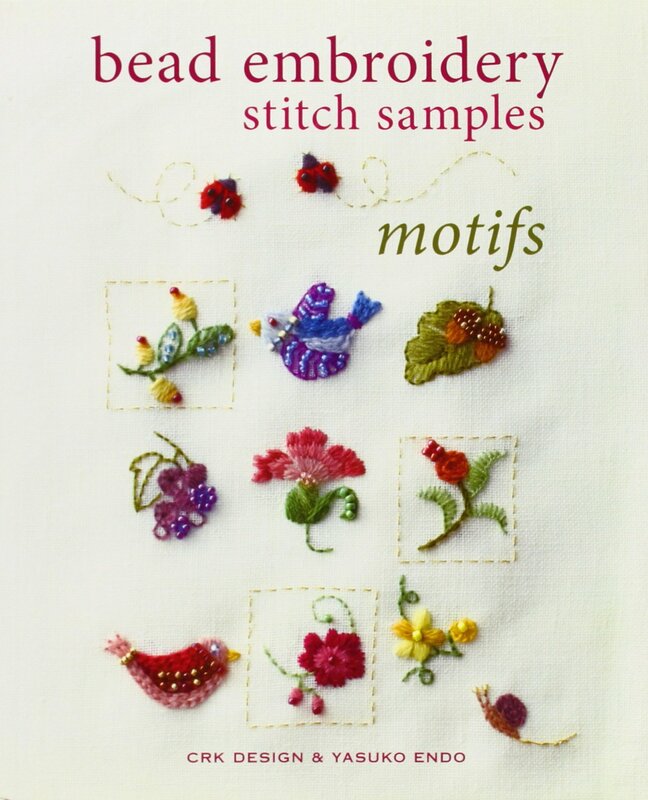 The stitching is simple, but by carefully building the motifs, one area at a time, and adding the beads for sparkle, you will have wonderful little stitched accents for your jewelry, quilts, or clothing! 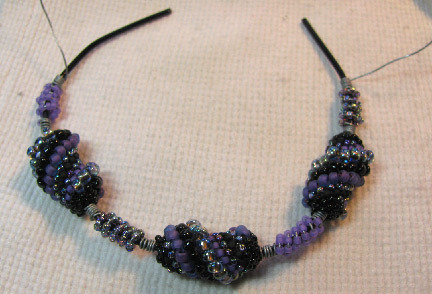 Last week I showed you a very pretty, but easy, way to feature some beaded beads in a wire bracelet. 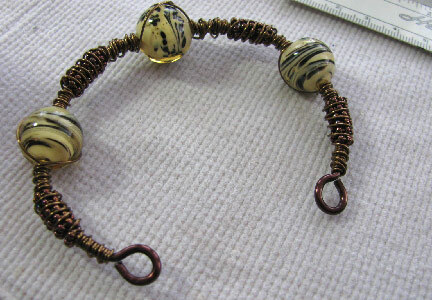 I got to thinking that the design might also work well to showcase some awesome Murano glass beads that I bought years ago in Italy and have been hoarding saving for the right project ever since. I used 12 gauge wire as the base and 22 gauge as the wrapping wire. I couldn't fit both the wires through the bead hole, so I buried the ends by wrapping back over them as shown. The 12 g was about 9 inches long, so as you can see, I was starting from the center and working outwards. I used 2 pieces of 22 g that were each about 2 yards long. Don't worry that the wrappings right next to the middle bead will be a bit wonky. That will be covered by the next step where you will spiral back with the wire. 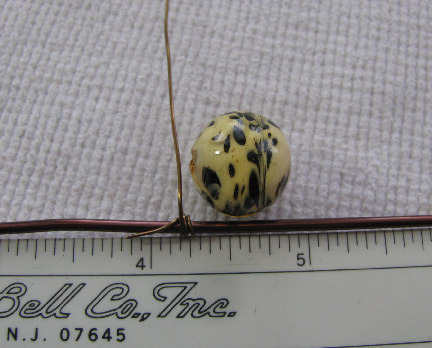 Bury the tails of the wrapping wire back next to the central bead. Trim the heavy wire and turn a loop on each end. I made a hook clasp similar to the one shown last week. The link is there for the instructions. 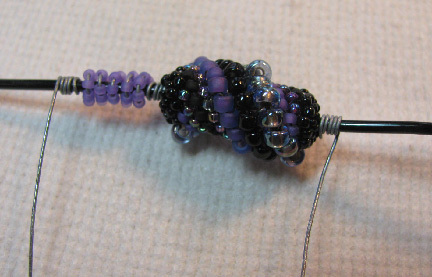 Last week I showed you how to make beaded beads using the Cellini spiral peyote stitch. 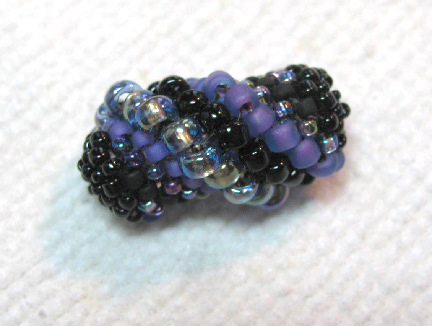 I made a total of three, using the same palette of beads, since I knew I wanted to use them in a wire bracelet project. I want to share that with you today, but you can alter almost everything about this piece to suit yourself: the colors, the wire gauges, the bead sizes, the exact placement of components. Make it your own! Just make sure that the gauge of the bracelet armature is heavy enough to hold its shape, and that the wrapping wire is a thinner gauge (which means a higher gauge number). 1. Cut about 2 yards of your smaller wire and start wrapping the middle of the core wire from the middle of the wrapping wire. Work towards one end at a time. 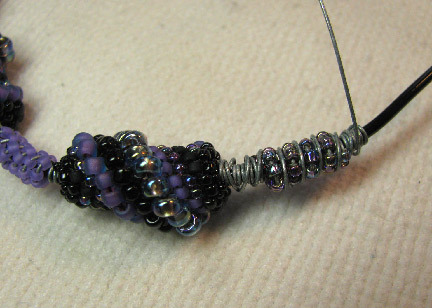 Add seed beads to some sections of wire (this is about 2" worth of size 11/0 seed beads before they are wrapped). 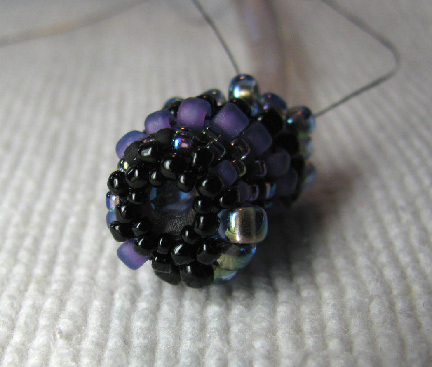 Slide the smaller wire through the beaded beads along with the core wire and start wrapping on the other side. 2. Work in a similar fashion towards the other end, wrapping the smaller wire several times to anchor at each end. 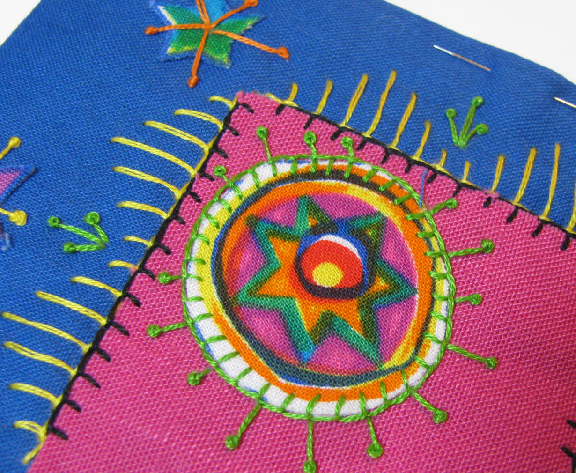 Don't worry if the beaded beads slide around a bit...that will be fixed in the next step. 3. 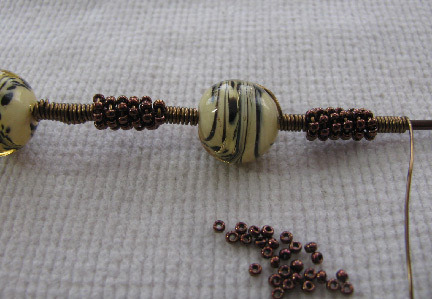 Using the leftover wire, wrap back and forth across the seed bead coil and the first layer of wire wrapping. Tuck and bury the end of the wire in the loose coil. To do the center portion, cut a new piece of wrapping wire, about 2' long. 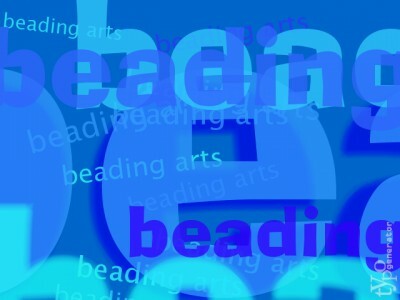 If you are able to, thread it through the center beaded bead and work from both ends, back and forth across the middle coils. If you can't get it through, just cut the wire in two and do each part separately, burying the ends in the loose coils. 4. 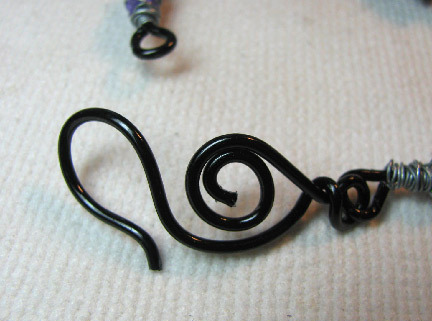 Turn a loop on the ends of the bracelet wire, trim and file smooth. 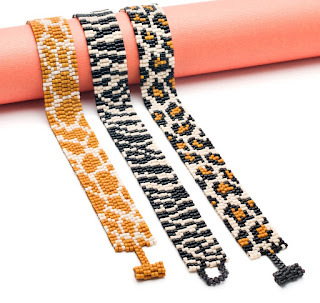 Create a fancy hook that is large enough to make the bracelet the proper size for you. Instructions for this particular hook clasp are at the link. 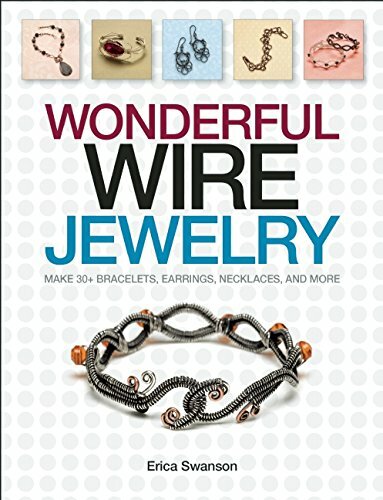 More than 30 beautiful projects by 21 designers are included in Wonderful Wire Jewelry, a new book published by Kalmbach. They have all previously been published in Wirework magazine, but if you don't subscribe to it regularly, this looks to be the best of the best! 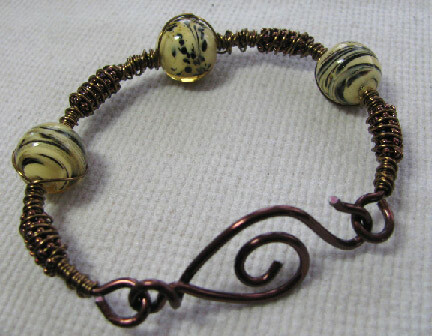 Wirework always intrigues me, and lots of these projects are very appealing to my eye. 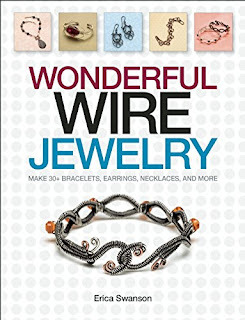 Most are made with sterling silver wire, but some use copper, steel, or artistic wire. I don't think there's any reason why you couldn't make substitutes for most of them if you wanted. You will recognize the work of many of the designers if you do any wirework at all: Melody MacDuffee, Eva Sherman, and Barb Switzer are some of my favorites. I would say that most of the projects fall into the easy to intermediate categories. Specialized jigs are recommended for a few, but most of the projects can be tackled with the tools you probably already have on hand for beadwork. Some of the projects look to be very complex, but most are actually complex pieces made from a series of more simple components. You can do this! The techniques and basics are all covered in the usual clear fashion that Kalmbach is known for. 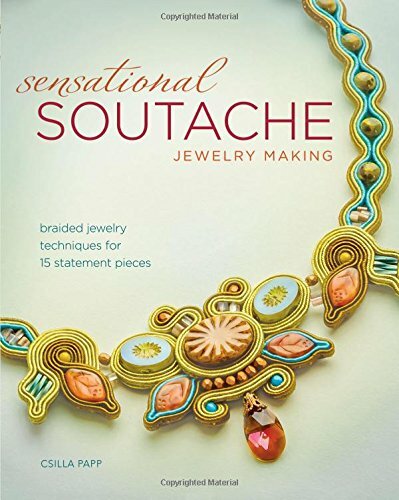 You will be able to learn coiling, free-form wire work, and hammering techniques as you work your way through the pendants, necklaces, chains, bracelets, rings, and earrings. There is something for everyone here! 1. 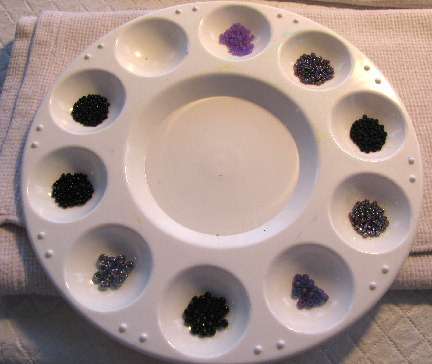 Choose your beads and set them up in pairs in a circle. 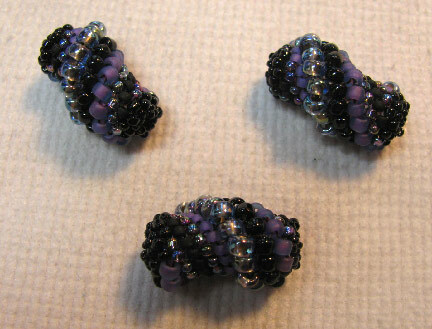 I used 4 pairs of size 11/0 seed beads, 2 pairs of size 8/0s and 1 pair of size 6/0s. This is the perfect number to go around a 1/4 inch (outer diameter) piece of vinyl tubing (find it at your local hardware store). 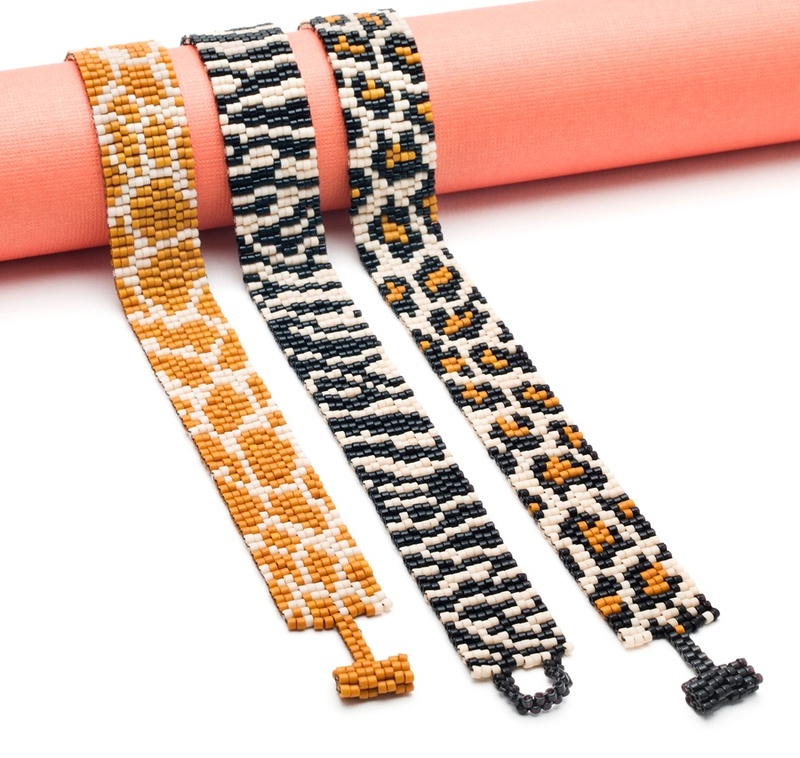 You will also need size 15/0 seed beads to finish each end. You can use other sizes and counts if you wish. 2. The "rules" for Cellini spiral are simple. 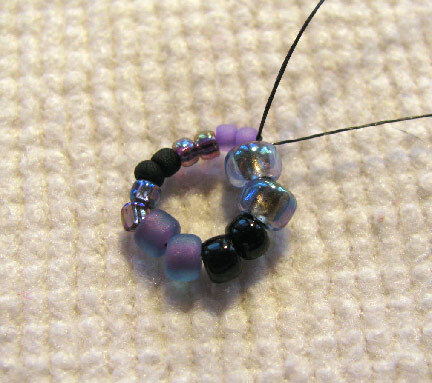 Pass your working thread through the first two beads (for me it will be the small purple ones at the top), and pick up one of the same bead just exited. Pass through the second bead in each following pair, and pick up the same bead just exited. 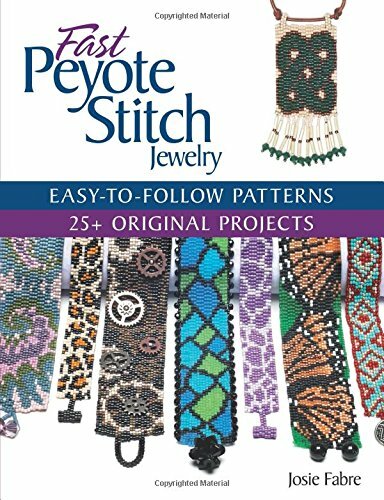 In this way, you will be doing peyote stitch all around the circle and shifting the color and size of the beads by one step each time. At the end of the circle, you will need to step up to start the next round, but that's the only thing even remotely tricky about the stitch. 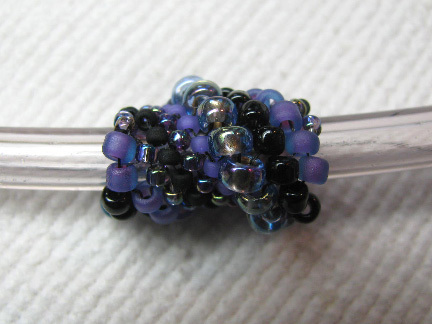 I used the vinyl tube as an armature, not really because it was needed for structure, but because I plan to use these beads with some wirework, and I thought it would make it a bit easier to work with them later, and protect the glass and threads from the metal. 3. When your bead is as long as you'd like it, stitch 2 rows of peyote stitch with all size 11/0s and 2 rows with all size 15/0s to cinch the beadwork in over the tubing. The work shown above is missing the final row of size 15/0s so that you can see the opening a little better. Trim the other end of the tube close and repeat this step on that end of the beadwork. 4. 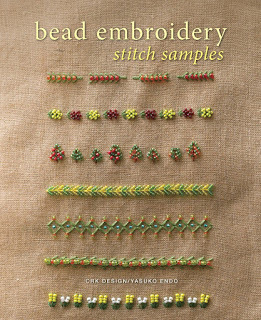 These beads are capable of keeping their shape without the tubing inside, but because they twist a bit, it really does make it a lot easier to thread them onto a project if you include it. Plus, it's so inexpensive at the hardware store! 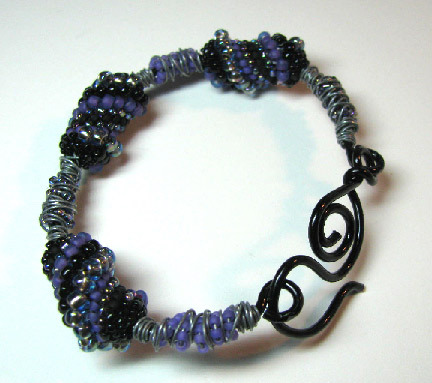 Here is the link for the wire bracelet that features these beaded beads!